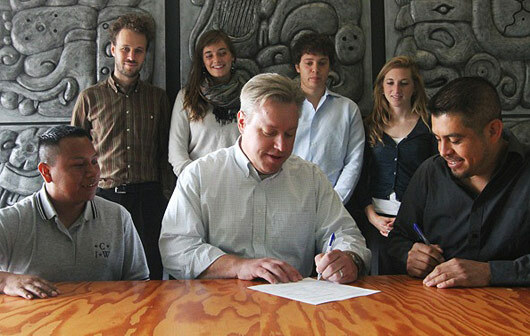 From left to right, the CIW’s Oscar Otzoy, Chipotle’s Chris Arnold, and the CIW’s Gerardo Reyes, joined in the background by student and faith allies, at today’s signing ceremony at Chipotle’s Denver headquarters. DENVER, October 4, 2012 – Chipotle Mexican Grill and the Coalition of Immokalee Workers (CIW), a farmworker-based human rights organization, have reached an agreement that brings Chipotle’s commitment to sustainable food to the CIW’s Fair Food Program. The agreement, which will improve wages and working conditions for farmworkers in Florida who pick tomatoes for Chipotle, comes in advance of the winter tomato-growing season, when most of the nation’s tomatoes come from growers in Florida. Chipotle becomes the 11th company to join the CIW’s Fair Food Program, which is designed to create a sustainable tomato industry through respect for the rights and concerns of all involved. The Fair Food Premium paid by participating buyers like Chipotle is used to help participating growers improve wages and working conditions for Florida farmworkers. Steve Ells, founder, chairman and co-CEO, started Chipotle with the idea that food served fast did not have to be a typical fast food experience. Today, Chipotle continues to offer a focused menu of burritos, tacos, burrito bowls (a burrito without the tortilla) and salads made from fresh, high-quality raw ingredients, prepared using classic cooking methods and served in a distinctive atmosphere. Through our vision of Food With Integrity, Chipotle is seeking better food from using ingredients that are not only fresh, but that—where possible—are sustainably grown and naturally raised with respect for the animals, the land, and the farmers who produce the food. A similarly focused people culture, with an emphasis on identifying and empowering top performing employees, enables us to develop future leaders from within. Chipotle opened with a single restaurant in 1993 and currently operates more than 1,300 restaurants. For more information, visit Chipotle.com. of farmworkers, to help expose and fix the worst abuses and apply their unique knowledge toward modernizing, and humanizing, our farm labor system. Again, with this agreement, all plans for this weekend’s action in Denver are CANCELLED. There will be much more on this developing story in the days ahead, so check back again soon!